baked goods for this weekend's bake sale!!!! On behalf of the 2018 Board of Directors of the Porquis Agricultural Society I would like to extend a sincere “Thank You” to all of the people who have taken the time over the years to volunteer as board members. Without all of you our fair would not have made it to our 100th. Also to all others who have taken the time to participate in our various events. 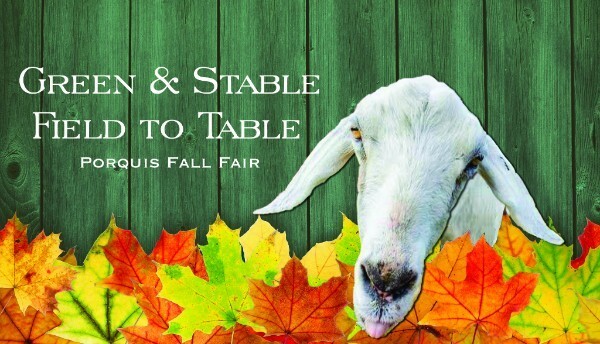 The purpose of our organization is to promote and educate all about agriculture and we do that by having our annual Fall Fair. This year we are celebrating our 100th Anniversary. This year’s Fall Fair book, 2018, has been created for this year only as it is an Anniversary Special book. A new booklet will be designed and issued for 2019 and 2020. We hope our participants and exhibitors will enjoy all of the activities we have planned this year which includes an Agriculture Education Day, seven Western Gaming shows, our annual Fall Fair with a Heavy Horse Pull, many exhibits, demonstrations such as the Chainsaw Carving, local talent, children’s activities and returning our annual fireworks display on Sunday night. There will also be other events such as, breakfasts, dinners and other fundraising activities. We hope all of our participants will encourage family and friends to join us, whether as a member of our society or as a visitor to our many events. Get young family members involved in exhibiting by having them create, grow or build exhibits and enter in our Fall Fair. 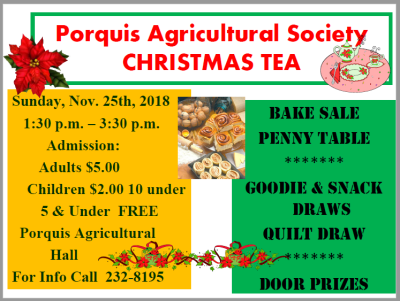 Community involvement is important to small organizations such as The Porquis Agricultural Society, and it is this continued involvement that will keep “Our Fair” going strong. As you stroll through the fair grounds please feel free to approach any of the directors and indicate your interest in our group. We encourage new ideas and new members. We will see you at the Fair and we know you will have fun.